Those who have been in love know how amazing it is – the feeling of not wanting to be away from them and the sincere joy of seeing and being around them. They also know how hard it is to be separated from them. 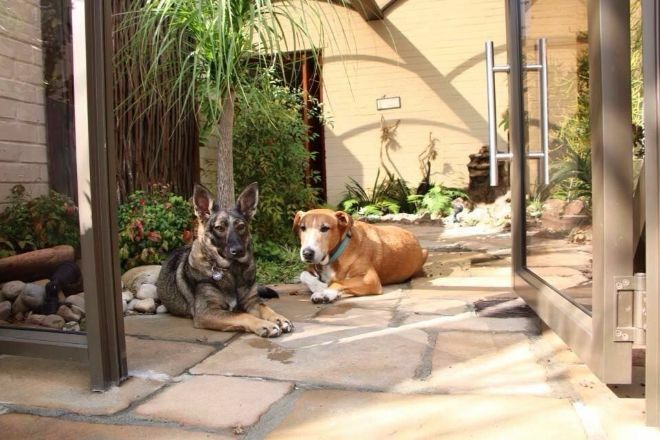 That’s the story of Caesar and Saskia, two dogs from Cape Town, South Africa. Prior to them meeting, Caesar and Saskia lived in separate areas of Blikkiesdorp, a township of Cape Town. Blikkiesdorp is home to some of the poorest people. Those who reside there live in shacks of scrap metal, pieces of wood, and old tires. It is also home to extreme violence. Blikkiesdorp is not only dangerous for humans to live, it’s dangerous for animals, too. (The Dodo). 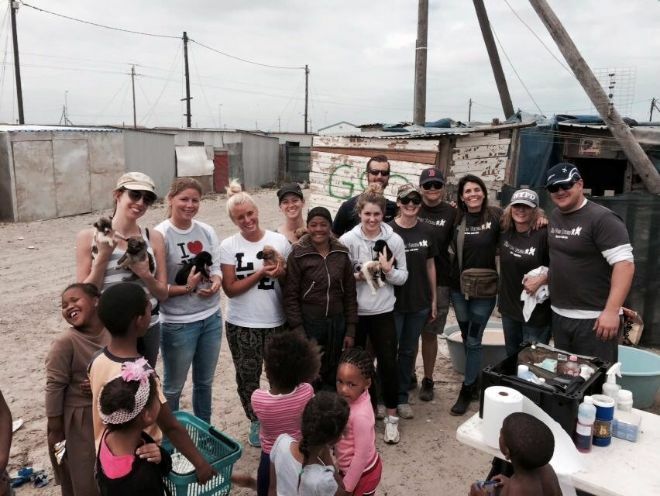 Clarina Hanekom, Rosie Kunneke, and Dinielle Stockigt, three women from South Africa, decided to do something about the suffering animals. They started Tin Can Town, an organization offering life-saving services to dogs and cats. They, along with a group of volunteers, regularly hold days where they will spay and neuter animals, provide food, and offer veterinary care. On one of their outreach days, Kunneke met a senior, red-coated dog named Caesar. “He was quite skinny, and we always made sure he had something to eat. 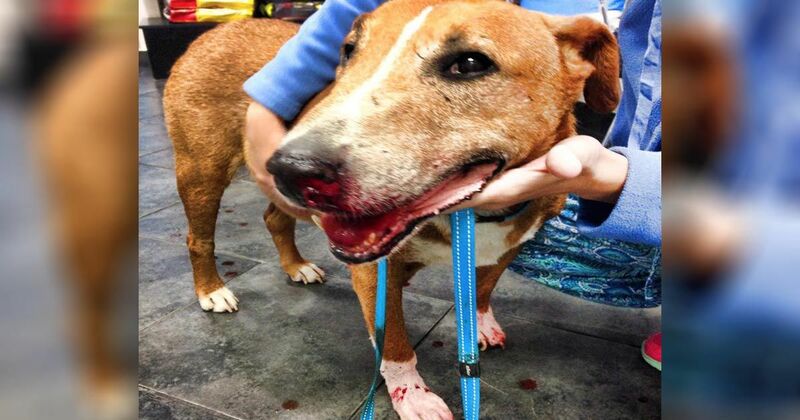 We castrated him and also provided the vet care he needed,” she said. (The Dodo). When Caesars owners broke up, he went to live with the woman but she failed to take proper care of him. To make matters worse, kids would throw rocks at him and he suffered from some severe injuries. When Tin Can Town found him, he had several cuts on his head and a very bad wound on his nose causing him to bleed for days. At 10-years-old, Caesar couldn’t stay in Blikkiesdrop any longer. Kunneke decided to place him in a foster home. In the meantime, Hanekom found out about a four-month-old puppy name Saskia living a nearby neighborhood in Blikkiesdorp. She was very malnourished and suffered from gastroenteritis. Saskia received the medical attention she needed but when Hanekom tried to take her back to her owners, she realized the owners gave her an incorrect address as she ended up at an empty lot. Hanekom decided to put Saskia in a foster home. (The Dodo). 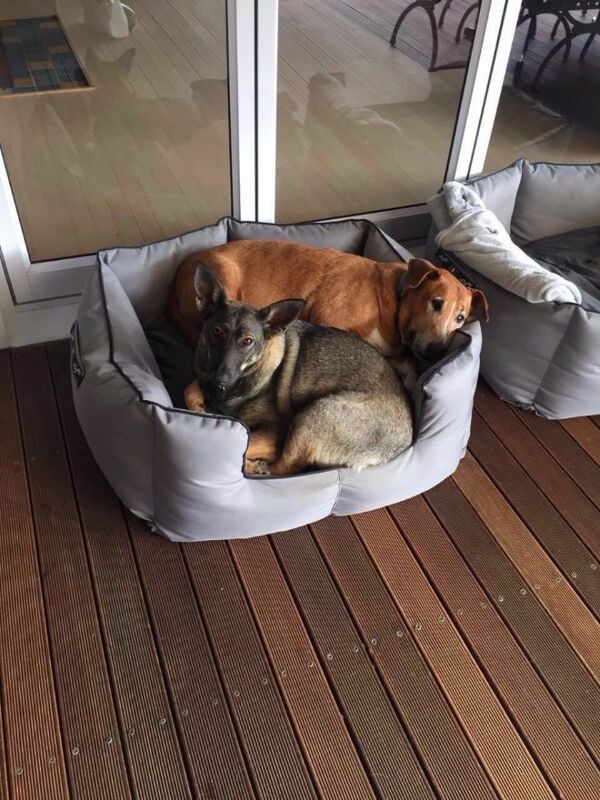 In a surprising turn of events, Saskia went to the same foster home as Caesar. The two immediately fell in love. Saskia would follow Caesar around and they would sleep in the same dog bed. Caesar would never get irritated at Saskia – they hardly left each other’s side. When the day came for Caesar to get adopted, everyone was thrilled – except Saskia. According to Kunneke, “She was definitely depressed and missed him. She wasn’t interested in playing that much, and would just lie in the bed where she and Caesar normally slept together. She was always looking for him.” (The Dodo). Saskia’s foster parents tried everything they could to get Saskia adopted with no luck. As fate would have it, Caesar’s adopters contacted Tin Can Town a few months later to adopt a friend for Caesar. They said Caesar was depressed. The staff knew exactly who to recommend: Saskia. It was a heart-warming reunion, to say the least. Caesar instantly recognized Saskia. The two shared lots of tail wags, kisses, and Caesar gave Saskia a tour around the house. The icing on the cake? The two followed their reunion with a nap in the same bed - just like old times. They haven't left each other's side since.